I am fortunate that organizing is one of my strengths. Since I know that there are many others who don’t have this ability, I like to lend my help when I can. 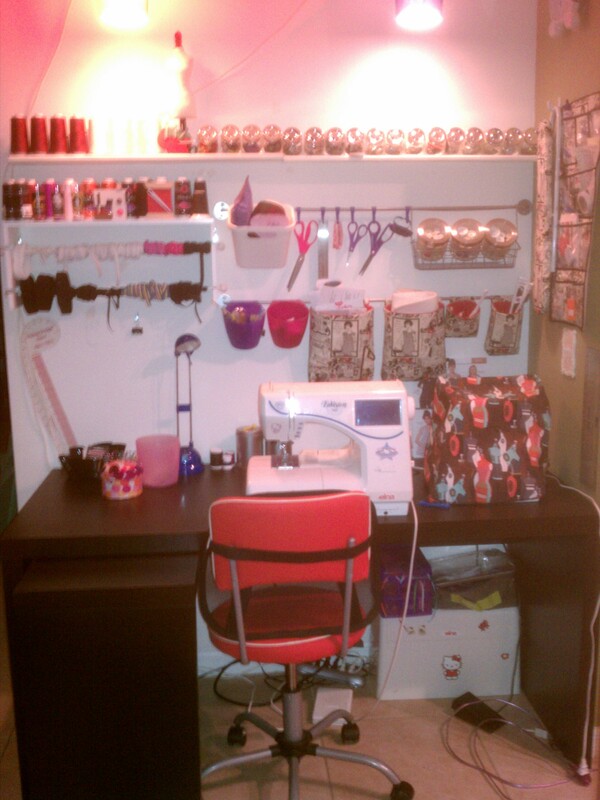 To that end, I’m sharing pictures of my sewing and crafting area. I don’t have a separate room for my sewing and crafting, but this doesn’t bother me. I’ve had one before, but I never used it because I felt isolated from the rest of the family, and I missed having music and/or TV in the background (those things are in the living room in our house). Our current house has an open floor plan that is quite spacious by my standards, so I found a nice little corner between the pantry and a doorway. The previous owners just stuck a baker’s rack there; there isn’t much you can put in such a location. 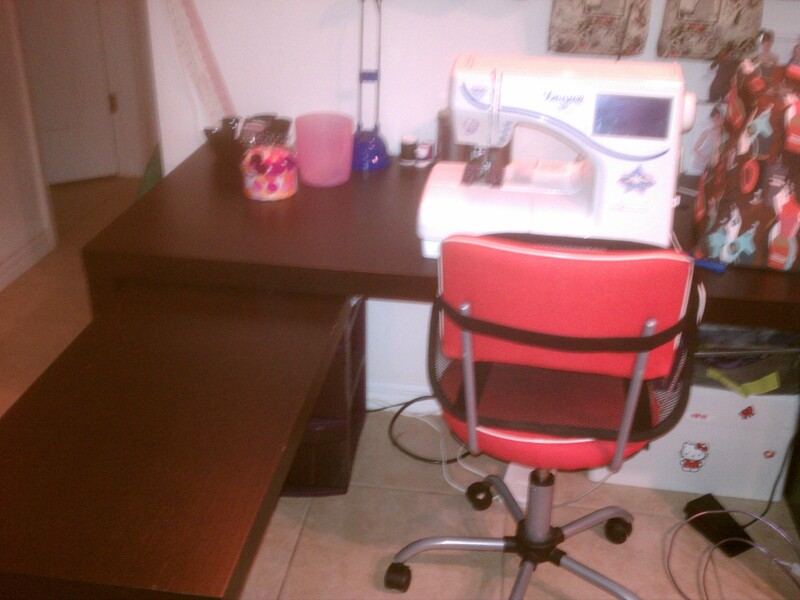 Lucky for me, it’s the perfect sewing area, especially after a trip to IKEA! First up is a photo of the entire area with the exception of 2 things which I’ll show you at the end of this post. The desk is from the Jonas series. It has a pull-out panel that can go on either side. It was $130. On the desktop I keep my sewing machine, serger (a Brother 1034D, under the slipcover), lamp, small trash bin, pincushion, glue gun, and a bowl for little miscellaneous stuff. Underneath the desk are sewing projects I’ve cut out and are ready to sew, plus a plastic bin with 4 drawers where I keep sewing notions. Next is my elastic rack. 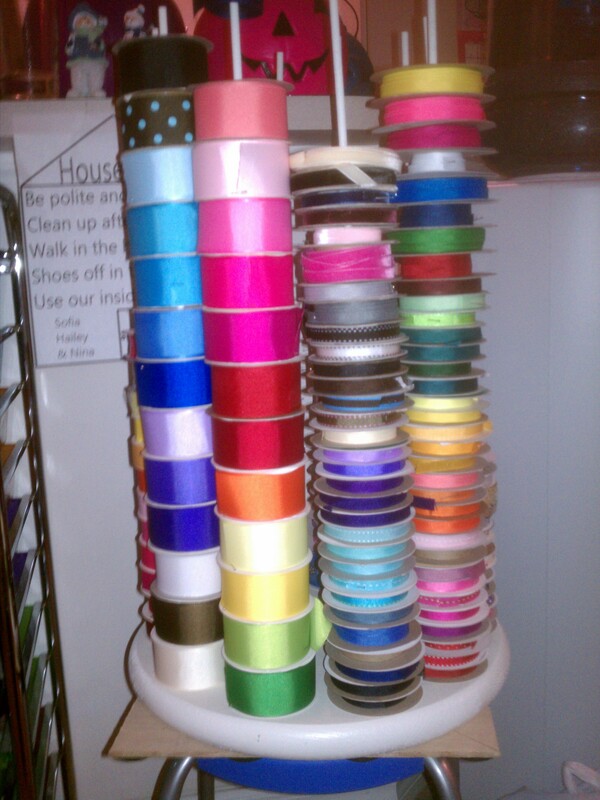 This was sold at Michaels as a ribbon rack; I’m not sure if they still sell it. I used it for ribbon until my stash outgrew it. That’s my serger thread and some decorative items on top. Since I’m working with a small space, I decided to utilize wall space- a lot. This is where IKEA really came in handy. I labeled everything in the photo, but I’ll name it here as well so I can link to the specific products for you. The little jars hold small sewing notions like snaps, hooks/eyes, buttons, rivets, eyelets, buckles, etc. IKEA sells a spice rack to fit this jar, or you could put them on a shelf like I did. You can add that rubber shelf liner to the shelves if you’re worried about the jars falling off. The white bin is sold as a recycling bin, but I store my pressing ham, hand-sewing kit, and plastic pill bottle that I keep dull pins and needles (you don’t want those poking through your trash bag and stabbing you!). In the 3 jars in the wire basket is my thread. Those purple hooks hold scissors, metal ruler, and a wrist pincushion. I forgot to label the pink and purple plastic cups, but those are also at IKEA for $1. Those have sewing tools in them. 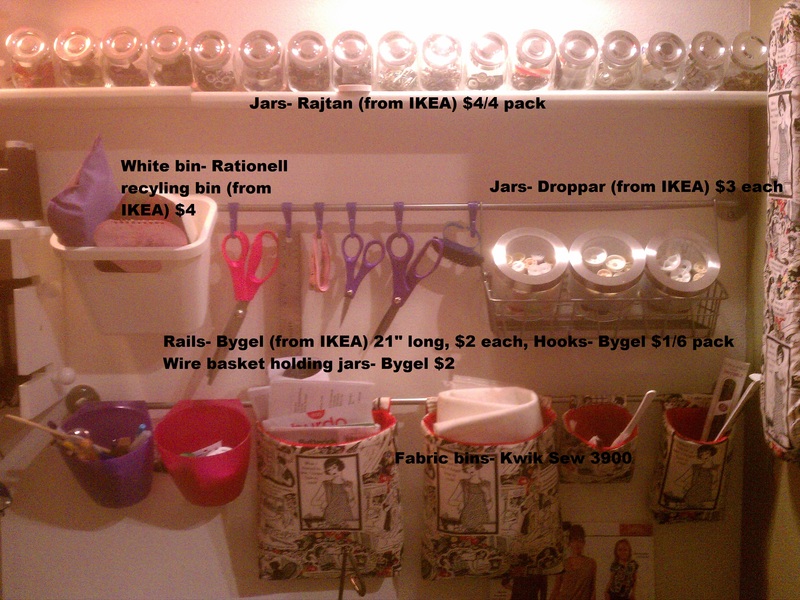 The fabric bins are Kwik Sew 3900, a great fabric organizer pocket pattern that I modified for use on the rails, which are also from IKEA. Each pocket has a long tube on the back which a cafe curtain rod goes through to hang it from. Since these rails are permanently affixed to the wall, I needed to make this tube so it could open to put it on the rod. I did that by lining it and sewing Velcro to the back of it and the pocket. Those pockets hold things like patterns I’m working on, press cloths, zippers, and parts for my serger. 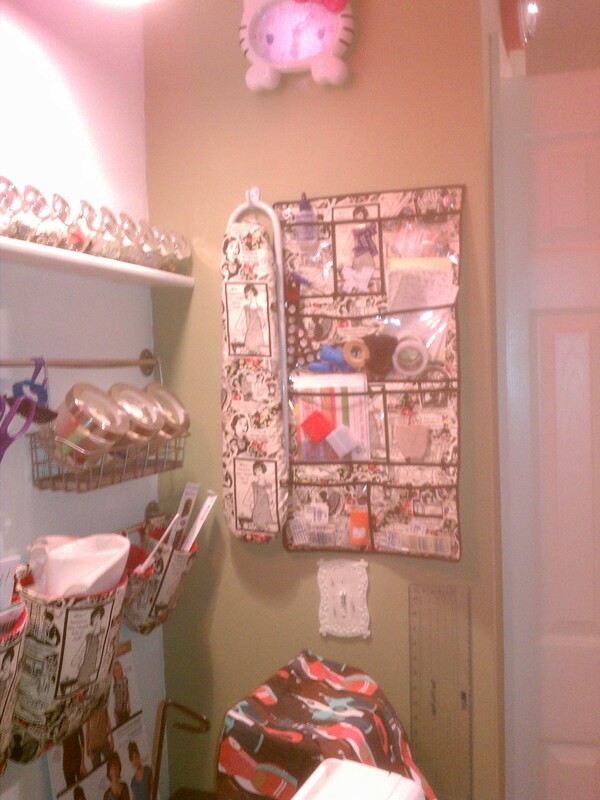 Here is my sleeve board (for pressing small items) which I covered in the same fabric as the wall pockets (hanging from a coat hook), and a wall organizer I made, also in that fabric. It makes for a nice, neat, uncluttered look. That’s especially important since this is in our main living area. 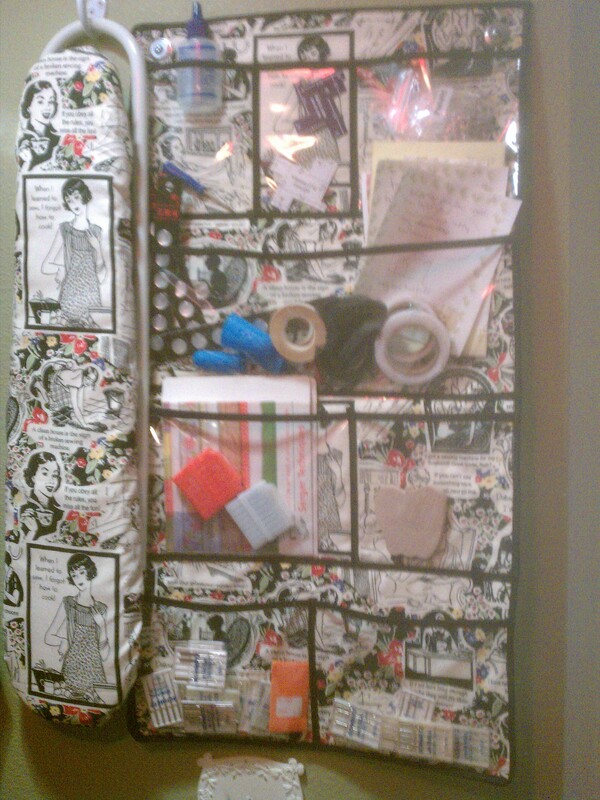 The wall organizer is made with a piece of thick interfacing fused to the main fabric, bias tape around the edges, and vinyl pockets with bias tape on their upper edges. I put grommets in the upper corners for hanging. This holds all my sewing machine needles so I can see all of them easily, plus other small notions that didn’t fit anywhere else. The 2 other organizational tools I have that are behind me when I’m sitting at the desk are below. 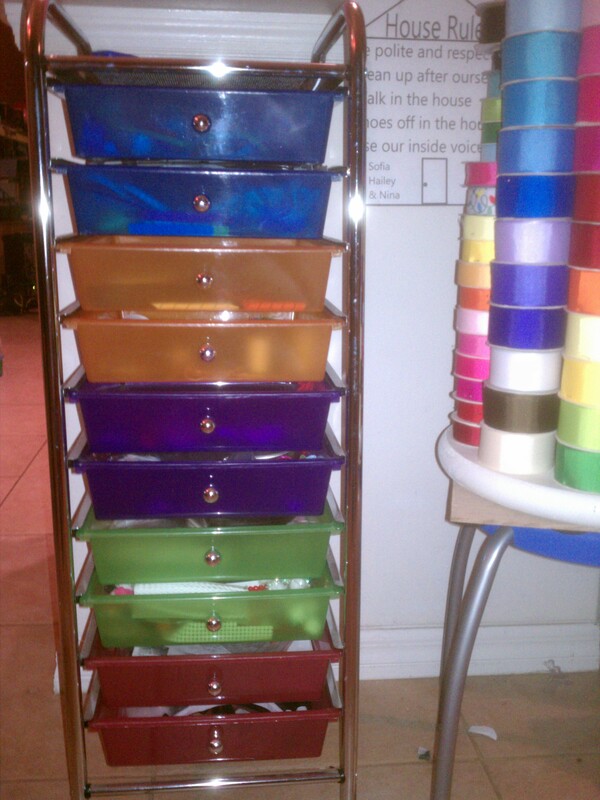 The first is a lazy susan ribbon organizer that my husband made for me. It’s made from a prefab table top from Home Depot, 1/4″ wooden dowels glued into pilot holes, and a lazy susan bearing purchased here, attached to a scrap piece of wood. The other item is a cart available from several retailers including Joann Fabrics and Crafts and Michaels. I keep my bow making supplies in it. I think that covers everything. If you have any questions please ask and I’ll be happy to answer them! ← Homemade chocolate syrup, much healthier and easy to make!